I love sundays. Especially now in Egypt because it’s the first day of the (work)week here, but in Holland it’s still weekend. So for me it’s the perfect day to work and focus on styling and photography. Because e-mails and phonecalls starts mostly from monday. ;) This time I want to show you our white sofa in the livingroom. When we were decorating our home we knew immediately that we wanted a big sofa. For the colour we had a doubt of light grey or white. We have been visiting a lot of stores here in Cairo but at the end we found our sofa at Ikea. The Norsborg in this off white fabric fits perfect in our livingroom. It connects with the white bright walls and the colours of the cushions looks amazing on it. I like the birch legs which made the sofa a bit off the floor and give it a spaceous look. I prefer to choose a sofa with legs when you decide to put the sofa in the middle of the livingroom. When you put the sofa to the wall you can choose for a sofa without legs. But for now I think we made the best choice. We choose for the fluffy Varamin rug, it’s so soft for the feed and love the natural look matching the sofa. I also love the fact we put the sofa in the middle of the room so we create this cozy sitting area in front of the tv. In the next blogpost I will show you the choices we made for the tv cabinet. Oh and I really have this thing for round coffee tables. I love to combine a mix of round tables in different sizes and materials. I used them before in my previous dutch home and also for this interiordesign I made for a home in Haarlem. 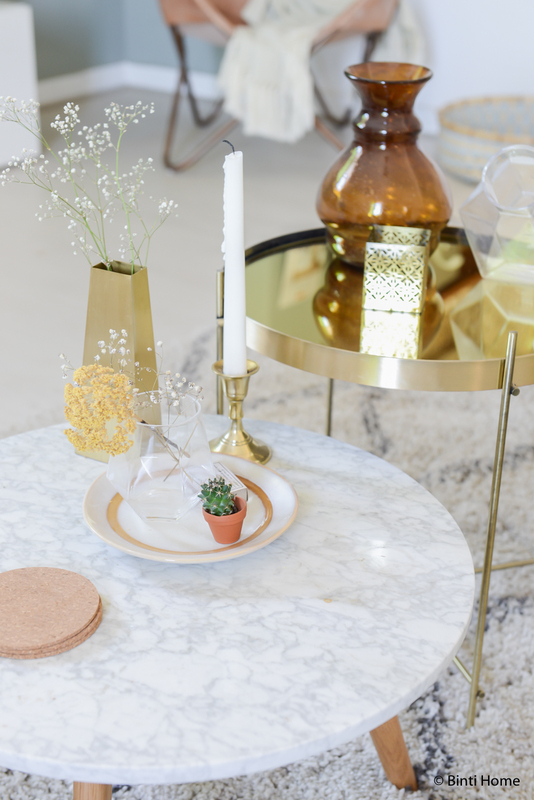 And now these two pretty tables from Dutch brand Zuiver are shining in our livingroom. As you might know I love the material brass and the colour gold, so this Cupid table from Zuiver is an amazing catch. Combined with a round marble table in white gives a good and sophisticated balance. And as always, I want to create a balance. How I do that? 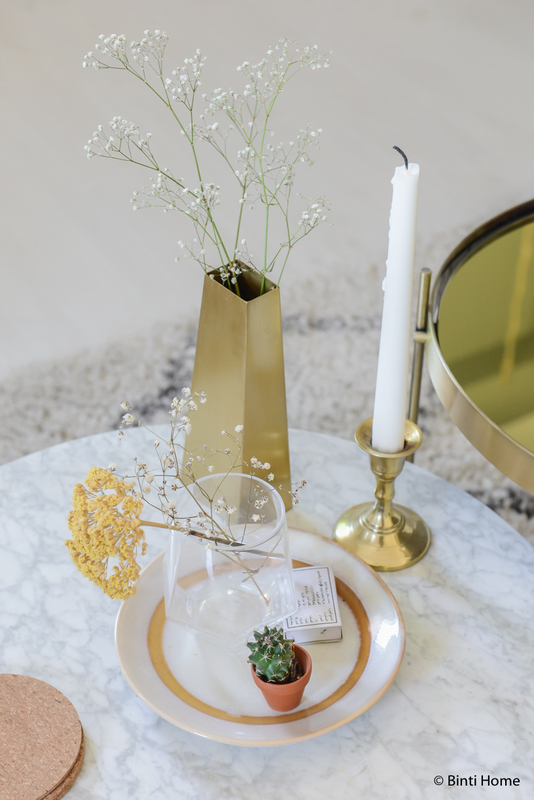 I put some accessoiries with gold on the white table so it connects with the golden table. 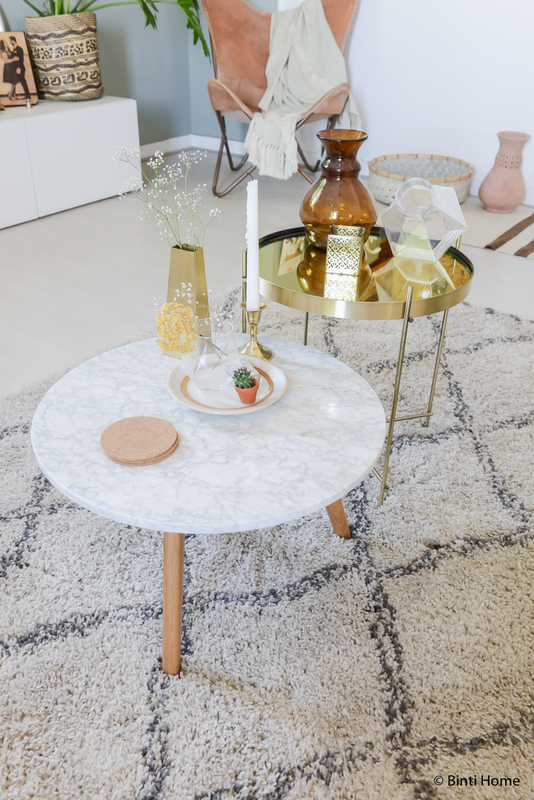 And I put some white, or this time transparant, on the golden table so it connects with the white marble table. And for a finishing touch add some plants, a mini cactus for example. Also candles are the best decoration piece for on the coffee table, actually I use them the whole year. And as I love fresh flowers, I also like the dry flowers such as Gypsophila muralis ( google that ;) ). They look cute and stay pretty for a very long time. I think these are the basic ingredients for nice decorated coffeetables in front of our white sofa ;). What do you think? Want to see more of our home? Check Our Cairo Home here.